During the event “La Dronisation de la Guerre, entre Stratégie et Normes?”, organized by the Madariaga College of Europe Foundation and held on 13 June 2014 in Brussels, two panelists covered the legal consequences of armed drones’ widespread employment by certain states and non-state entities. Mélanie De Groof, from the Antwerp University and researcher for the Groupe de recherche et d’information sur la paix et la securité (GRIP), and Frédéric Coste, researcher for the Fondation pour la recherche stratégique (FRS), have put forward a definition of the different kinds of drones and illustrated the current status of drones usage and its possible legal implications. At present, the thematic has a huge relevance, as the US, the UK and Israel have extensively resorted to armed drones in theaters of war, whilst between 40 and 76 other states are developing such systems. Furthermore, non-states entities as Hamas or Hezbollah already employ them. Under president Obama’s administration, the US use of drones has increased six fold; there is a global trend to systematise their employ, as the recent technological developments have allowed more and more states and other groups to carry on extra-judiciary executions by resorting to drones. But as combat drones are imposing themselves because of their military strategic advantages, and states are unlikely to stop using them only because of the moral considerations put forward by the international public opinion, attempts to delegitimise them appear to be ineffective and counter-productive. While combat drones present undeniable military advantages to both public and private shareholders, the attempts to delegitimize them have fallen on deaf ears. States are unlikely to stop using drones based solely on the moral considerations put forward by the international public opinion. Customary law could prevail, leading to a generalisation of the drones’ employ, with possible further chaotic consequences at the international level. It is the UAV (Unmanned Aerial Vehicle) the system generally referred to as a “drone”, and it can be further divided in two categories: civil drones and combat drones. Both have common characteristic: they are mobile devices without any crew on board, they are remote-controlled, they carry a system collecting data, and they can be used to pursue civil or military aims. Regarding their first usage, their main function is to collect aerial data; consequently, they are employed in border controls, in overseeing illegal immigration, during sport events and electoral processes, to rescue victims at times of natural catastrophes, for agricultural inspections, etc. Considering their second usage, the UCAV (Unmanned Combat Aerial Vehicle) are the ones in question. They are equipped with collecting data systems and/or armed systems, and they are able to release bombs, missiles and other kind of explosives. A remote human control is required in real time, as drones differ in that from robots, which are instead able to select and hit targets without any human guidance. The advantage of the combat drones consists in the possibility of eliminating targets everywhere in the world, breaching interstates borders without any risk for the absent crew. Furthermore, thanks to their large autonomy (several days, depending from the drone model and functions), the sending state or entity can be permanently present in key areas if they possess multiple drones. An additional distinction can be made when considering the target of an attack. Personality strikes are carried out when the person or persons targeted are, with a high degree of certitude, the objects of the attack. Conversely, signature strikes presuppose that the targets are chosen based on their suspicious behavior or physical characteristics and not because of their identities. It is the latter kind of strikes that is more likely to cause the highest number of civil victims and other collateral damage. According to different sources, between 2400 and 4000 persons have been killed by US drones in the most recent years, and the percentage of civilians would be between 15% and 90% depending on the reports. Data is not reliable as the states and other non-state entities using drones tend to occult the number of victims, many of whom are civilians. This kind of strikes are often conducted in situations of civil war and the fight against terrorism, due to the fact that in conflicts fought with asymmetric techniques it is not always feasible to distinguish the civilians from the combatants. Furthermore, a massive employ of such strikes could lead to psychological consequences for the population living in the areas targeted by the drones, where people live under constant the fear of becoming the next potential targets. But is the drone usage legal? If yes, in which situations and under which limits? Such questions have to be answered by referring to the international rules concerning the use of force, human rights and humanitarian law. Concerning international public law, if a state demands or permits another state to military intervene within its borders in order to shelter it from an external menace or to placate internal turmoil, then this is not the case of an illegal interference in the domestic affair of sovereign states. Nonetheless, the demand or permission must have been given freely and not the result of external pressures; the inter-state dialogue must occur between the legitimate governments of the countries involved. Instead, when such conditions are not present, the use of drones can be justified only if the conditions regulating the right of self-defense are applicable. And in any case, irrespective of the type of drone attack, it has to respect the principles of distinction, necessity, proportionality, precaution and to prohibit the superfluous injury and unnecessary suffering of combatants. It appears that especially the signature strike attacks pose several questions about the respect of such binding rules concerning the jus in bello. On the other side, such systems are perfectly able to fulfill legal usage requirements; for instance, drones are able to discriminate targets, a practice that was impossible in the case of MDWs (massive destruction weapons). Therefore, drones should not be considered illegal weapons a priori. They should be outlawed only once their users do not respect the rules applied to any other kind of lethal devices under the International Law. At this point, it is unavoidable to note how the US has elaborated a sui generis legal framework. Extra-judiciary executions are indeed deemed legal by the US domestic law, and the state has declared itself at war against a non-state entity: a non-international transnational armed conflict against Al-Qaida, according to the US doctrine. In sum, using Dr. Coste’s words, a “glocal” war has been undertaken by the US, conducted on a global level but having local manifestation. 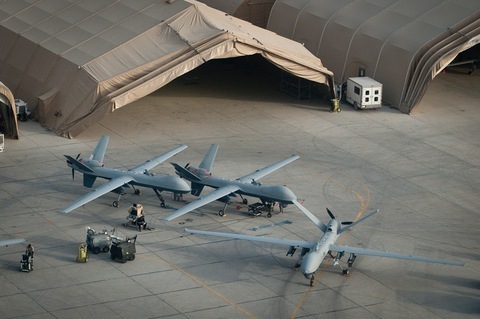 Legitimised from a domestic legal perspective and politically sanctioned, the US propensity to use military force has been systematised with regard to the employ of drones. Nonetheless, the situation appears to conflict with International Law, as their definitions of conflict and enemy differ, making it difficult to translate the US actions in an internationally shared legal framework. The US seems to avoid engagement in the global debate on the topic of drones at both the intergovernmental and civil society level, as its foreign policy, international engagement and military doctrine heavily rely on armed drones. Nevertheless, the increasing rights violations accompanying the use of drones should prompt international organizations such as the UN and the EU to advance the issue on their agendas and tackle it in a comprehensive, legal and political way. This entry was posted on 18/06/2014 by ISIS Europe in Conferences, Contributors, Manuel Tornago and tagged drones, EU, Internatinal Law, terrorism, US.